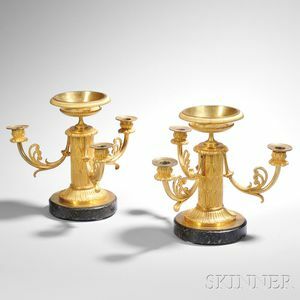 Pair of Empire Ormolu Three-light Candelabra with Tazza, Italy, early 19th century, each with central urn trays with guilloche rim atop a carved leaftip pedestal, with unfurling foliate armature and drip cups designed as spreading petals, all resting on round verde marble plinths, total ht. 11 1/4 in. Provenance: H.M. Luther Antiques, The Carlyle, New York.